The table is beautiful and the price was fantastic. Solid, sturdy and looks more expensive than it was. Recommend! Add elegant design and style to your home with the Beckett Antique Accent Table by iNSPIRE Q® Classic. This versatile table can be used as a nightstand, end table, or breakfast table. The table has a traditionally styled pedestal base and lathe-turned detailing for charming character. This table will fit in country, shabby chic, and traditional styled spaces. The rounded silhouette allows for space-saving placement, and the elegant style ensures that it will match well in many decorative schemes. The table is available in a variety of antique finishes with rich wood grain detail. 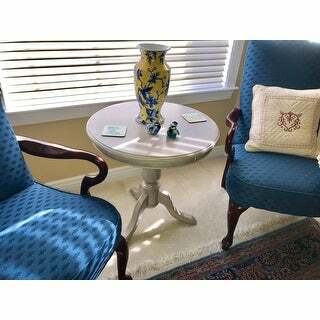 This table was purchased to use in my master bedroom for a sitting area/reading nook. I purchased a neutral upholstered accent chair and farmhouse-style lamp to complete the look. I’m very happy with this table. The wood is a lovely blonde color and looks more expensive than it was. Also easy to assemble. Would definitely purchase this table again. The table is made very well. It was easy to assemble. I would definitely recommend this table . The color is true to the picture. We love it! Absolutely Love this Pedestal Table! It is a great height. Most accent tables seem so short and small. This one will not disappoint. We are using it between two wing back chairs...it's perfect. Very sturdy and beautiful color. I like it so much that I just ordered another one! Looks and feels quality. Be aware that the antique white color has a grayish hue. Also it is rather tall so check your measurements. For us, it all worked well! I love it! my vision became a reality with this table. I put the table together all by myself. I dont usually put anything together but this was quite simple. the finished product elegant and classy. 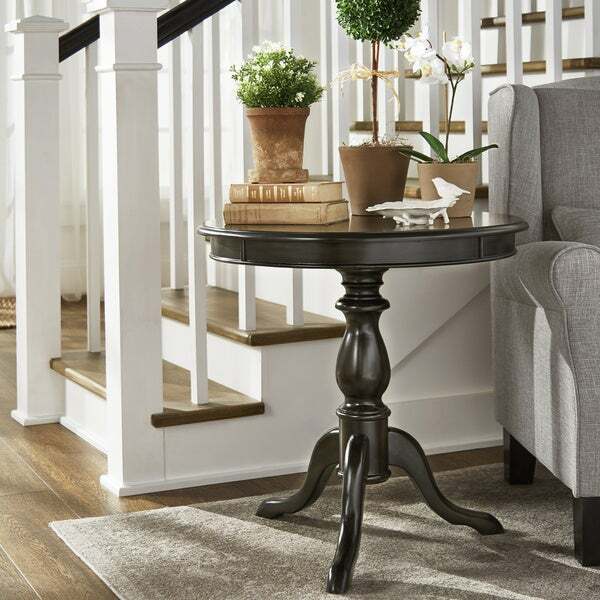 This is a beautiful pedestal table I bought it for my foyer right when you walk into the front door it’s the first thing you see it is the perfect size for an entryway table and I love the finish. It looks more expensive than it actually cost. Would highly recommend. Well made! Lovely! Fits in the room perfectly! The accent table is made well. Larger in size than shown on pictures. The color is like a blue- black navy. Found the assembly to be pretty easy. Love this table! Table is beautiful, ordered the black option and it's exactly as expected. I was looking for a quality table to place in my reading room next to a large chair. This table more than fit the bill. It is well crafted and a beautiful addition to my room. "What is Rubber wood? Since the black color is out of stock can I still get it at this current sale price when it becomes available? " Hello, please go to https://help.overstock.com/help/s/ for help on returns and other information. "One of the table color options looks like antique black, but only dark denim is offered. What is the true color?" "Do I need to put a coaster as not to get a water mark on the table"
Yes, we recommend using coasters and place mats. It was the best for the accent chairs I ordered for my sitting room. Great, classic style and looks. Favorable, recent reviews of product.